Gerard Joosten just posted a picture of a flyer he found packaged with the latest Bionicle movie. 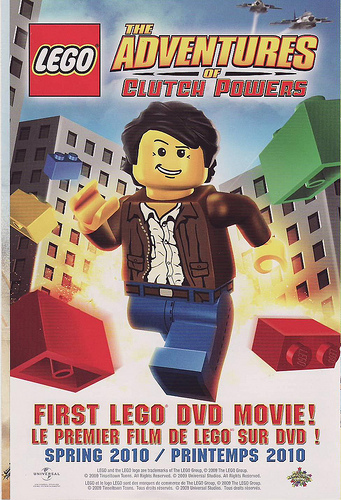 The flyer claims that “The Adventures of Clutch Powers” is coming to DVD in the spring of 2010. I’m pretty sure this isn’t the movie with which Warner is involved. There are Universal and Tinseltown Toons logos on there. What are your thoughts and feelings about this? It’s mentioned in the same article together with Direct-to-DVD Barnicle movies and Barbie movies. Also the term “family oriented” drops. Something tells me I’m not going to rent them. with all the disney/warner/DC/CN partnerships lego’s had, I had noticed that the bionicle movie was distributed by universal. struck me as odd. Clutch power, HA, I just got it. I’m torn. On the one hand, this flyer really doesn’t tell us anything about the plot, quality, or content of this film. What, you mean you haven’t watched the preview on the Bionicle 4 DVD a dozen times already? Oh wait, I wouldn’t have either except I have kids 3.5, 7 and 11 years old. It looks like silly fun with lots of humour. I an only imagine an angry police chief character yelling “POWERRRRRRRRRS!” while shaking his fist. Is it just me, or would he look like Charles Bronson if you gave him a mustache? Since there’s a Universal Pictures logo at the bottom, I’m thinking that’s a good guess. I like how he looks, they should make some Clutch Powers sets. @Fred – Perhaps you didn’t read the next sentence which mentions that fact? ‘Cause that name could be said by anyone! Maybe if we are very lucky we will get some of Clutch’s Indiana Jones torso w/yellow neck… that would be nice. I guess this settles once and for all that Bionicle is not LEGO. Good. Hmm I see, what is LEGO going for here? Maybe Austin Powers I dont know!! Not many of us get much out of stuff like this. It seems unlikely that the writing for this thing will be anything that would entertain us even if there are a few tongue-in-cheek jokes. Still if the DVD set takes off I wouldn’t mind a few action-oriented city sets for the hypothetical Clutch Powers line. Here’s a bit of new information for ya.